Hey there, name’s Theo Hansen, guest DJ for the Electric Fabric Podcast! This month it’s again DJ Bek who is hosting the Electric Fabric Podcast! And as guest DJ for the second half he invited none other than Theo Hansen, known DJ from Calgary in Canada, whom he got to know by chance, standing in line in front of the Watergate club in Berlin. And of course being a podcast guest DJ, Theo had to answer a few questions in our interview as well! 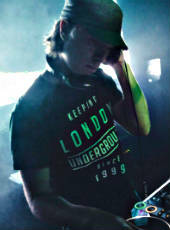 EF: Hello Theo, great to have you on board as one of our guestmixers on the EF Podcast. First of all, where are you from and how did you get in touch with electronic music? TH: Hey guys, I’m thrilled to be on the podcast! I’m from Calgary, Canada and I have two parts to answer that question. My introduction to electronic music happened in 2008 and it all began with Trance I have to say. The “In Search Of Sunrise” compilations by Tiesto, Above & Beyond and Deadmau5 were the very first inspirations that got me hooked. But then in 2011, my travels abroad lead me to find some different styles of electronic music (House, Techno and Progressive). Artists like Sasha, Sven Vath and The Chemical Brothers were some of the musicians that started to make the conversion for me. EF: So you are from Calgary (Canada), how does the club & artist scene look over there? TH: Right now I have to say we are at a peak. All genres and different scenes of electronic music are really booming. At the same time, the scene for underground electronic music is still very petite. For me the centre of it in Calgary is undoubtably Habitat. A small venue downtown that in my eyes is a haven for this kind of music. The DJs that have come through this nightclub have blown me away, and seeing such DJs in such a small intimate venue is something very special. EF: You are one of the residents of the quite known TEN Nightclub in Calgary. Did you had any special or interesting moments with one of the headliners? TH: The most memorable experience I’ve had at TEN without question was when I got to warm the decks up for Sasha. It still amazes me that we got to host such a legend. Being able to share a few words with him before and after his set was something I will never forget. Since getting into underground electronic music he has been one of the most influential and inspiring artists for myself. EF: Is there any specific sound, for which the TEN nightclub really stands out? TH: TEN really offers an immensely wide range of music, it seems to go through waves of different sounds. The Drum&Bass scene has always been huge here along with a lot of mainstream music too. Every so often we are graced with some artists I am very fond of, and to date that would include people like Matt Lange, UMEK, Sasha and a few others. EF: Our resident Bek met you in the line in front of Watergate Club in Berlin this summer. Tell us about your extended Europe tour. Where you have been and what have you experienced on your clubbing nights? TH: With my trip this summer it all kicked off in Ibiza. There are too many occasions that happened in the first week but some of the highlights included John Digweed at Pacha, ANTS at Ushuaia, Space’s 25th Birthday, Viva Warriors with Steve Lawler B2B w/ Hot Since 82 and Circoloco at DC-10. After this my ventures continued to Amsterdam where I experienced what could quite possibly be the best event I’ve ever attended. “Lost In A Moment” hosted by the legend Dixon, this was spectacular. Between the vibe, atmosphere and music it was beyond incredible. Artists like David August, The Howling, KiNK, Ame and of course Dixon absolutely blew me away. Then I carried on to Berlin where I happened to meet this German bloke who has invited me to do this podcast! Between Tresor, Watergate and Weekend – I had the best Berlin experience one could ask for…until the next time at least. My trip came to a wrap with “Eastern Electrics” festival just outside of London. I was most hyped to see Mano Le Tough and Art Department – they did not disappoint. tINI had a brilliant set too and the energy was ecstatic. Needless to say that it was an epic journey over the course of a month and it shall never be forgotten. EF: What kind of sounds do you like as a DJ right now? TH: Right now I’m digging anything from spaced out techno to groovy house. Some of my favourite releases have been coming from labels like Innervisions, Lost & Found, Phantasy and many others. I’m constantly exploring to find new sounds and artists. EF: Are there already any gigs planned for the near future? TH: Well I just had a warm up gig for Dennis Ferrer this past Monday which was a great show. The only ones currently lined up now are the 2 shows for my NYE extravaganza. I’ll be playing an early slot in Edmonton opening for Tiesto and then I’ll be headed straight to the airport to fly back to Calgary and play at Habitat with a special guest, yet to be announced. First time doing such a thing and I’m really looking forward to it. EF: Thank you for the interview and your guestmix!